Free investment advice may sound too good to be true, but thanks to computer algorithms, it's now possible. In fact, it's how FutureAdvisor, a three-year old financial website, aims to provide quality financial advice to average Americans who may not meet the lofty asset minimums that big advisory firms often require. 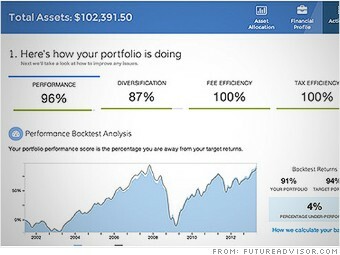 FutureAdvisor's algorithm analyzes your existing 401(k), IRA, and other investment accounts and compares them to model portfolios. It then uses that data to recommend how you should allocate your money across various assets classes and suggests specific trades you should make to improve your portfolio diversification and cost efficiency. For instance, FutureAdvisor often suggests that clients switch into low-cost index funds. (CNNMoney's 401(k) fee calculator is powered by FutureAdvisor data). "In one fell swoop, we've saved clients $1,000 or more in annual fees by moving them into low-fee index funds when it's more appropriate," said Bo Lu, co-founder and CEO of FutureAdvisor. For a low flat annual cost, FutureAdvisor can also manage your account. Users with less than $50,000 in total assets can pay $9 a month for FutureAdvisor to monitor their accounts on a daily basis and even execute trades. Users with more than $50,000 have to pay $19 per month, but also get advice on how to minimize capital gains taxes . --H.Y.